Head of State: the President, who is elected by the parliament or an electoral body. Term: 5 years. Current President: Ms. Kersti Kaljulaid, elected by the Parliament on 3 October 2016. Next elections: Autumn 2021. 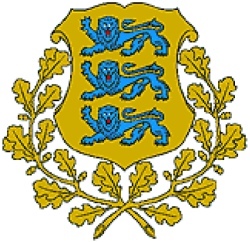 National legislature: the Riigikogu, a unicameral parliament of 101 members, with a term of 4 years. The executive power is exercised by the Government headed by the Prime Minister (currently Mr. Jüri Ratas from Centre Party). The parliament is empowered to appoint and recall the Prime Minister. As a counterweight, the Government can dismiss the parliament, with the consent of the President, and call new elections if the parliament expresses no confidence in the Government. Municipal elections: Term: 4 years. All permanent residents over 18 years old, regardless of citizenship are eligible to vote in municipal elections.